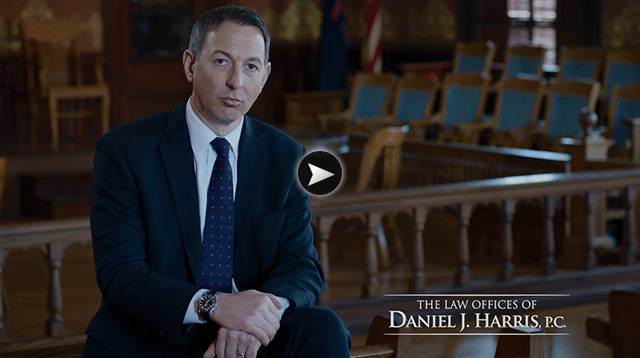 Practice Areas | The Law Offices of Daniel J. Harris, P.C. At The Law Offices of Daniel J. Harris P.C., we focus our attention on a comprehensive variety of legal services. We offer our expertise on twelve unique fields of law. Personal injury cases are common and consist of seven separate sub-categories including, car accidents, trucking accidents, premise liability, construction accidents, dog bites, boating accidents, and wrongful deaths. With 166 exonerations in the U.S. in 2016, it is so important to choose your defense carefully to avoid wrongful conviction. Our team has worked decades to ensure that we are able to effectively fight for your freedom. Our attorney’s working with social security disability cases have proven adept at safeguarding each clients needs throughout the court process. By working diligently, we are able to fight with conviction for each client’s benefits. On the job accidents can be frustrating for you and your family, especially when the fault is not your own. At The Law Offices of Daniel J. Harris P.C. we fight to protect your rights in accordance the Michigan Worker’s Disability and Compensation Act of 1969. Family law is one of the most sensitive types of cases to endure. We offer our unending support during a variety of family law cases including, divorce actions, custody disputes, child support actions, property division, annulment, prenuptial agreements, and spousal support (alimony) actions. Our loved ones are who’s most important to us. It’s essential to have someone you can trust by your side while planning for your estate, probate, and special needs. Our staff is trained to handle all aspects of such delicate situations. Special needs trusts are another frequently used service we provide. Handling cases involving someone suffering a physical or mental disability can be a delicate process. This process will allow you to leave inherited assets to a disabled loved one without affecting or jeopardizing that special needs loved one’s disability benefits or Medicaid benefits. You select a trusted friend or family member to act as the Trustee over your special needs loved one’s assets. The trustee has a fiduciary duty and obligation to the special needs loved one and is held accountable to those fiduciary standards for the benefit of your loved one. Our job is to fight, and win, for you. In all matters of general civil litigation we keep your wellness above all else, and strive to get you the best possible deal. It’s real estate law! Whether you’re buying your first home or a new vacation home, being protected is the foundation of ensuring a happy future. So pick out your new place, let us handle the rest. Driving yourself around is a big part of being self-sufficient. People should have the privilege to transport themselves from place to place. Our attorney’s understand this and continue to work tirelessly for your driver’s license restoration. Your business is your livelihood. Starting a new business can be exciting and nerve-wracking. Let us help! With extensive knowledge in corporate law and formation, we can make the process as quick and painless as possible. We provide a vast array of legal services all specifically tailored to assisting our clients with any and all possible legal requests. Our attorney’s are adeptly trained in handling cases pertaining to personal protection orders, landlord and tenet disputes, expungements, and special needs trust, just to name a few. If you are unsure if your legal needs match up to the countless services we provide, we encourage you to reach out for more information from one of our helpful staff. At The Law Offices of Daniel J. Harris P.C., we aim to provide the absolute best service in all aspects of our law practice. The well being of our clients is the most important thing to us. If you or someone you know has suffered and is looking for retribution, has been accused of a crime, facing family law issues, planning your estate for the future, or engaging in general civil litigation, we encourage you to call or visit one of our local offices to see exactly how our services can benefit you.